Cucurbit powdery mildew is caused by the fungal pathogens Podosphaera xanthii and Erysiphe cichoracearum. All cucurbits can be affected, however, cucumber and melons are less susceptible due to host resistance that has been incorporated in most commercial cultivars. 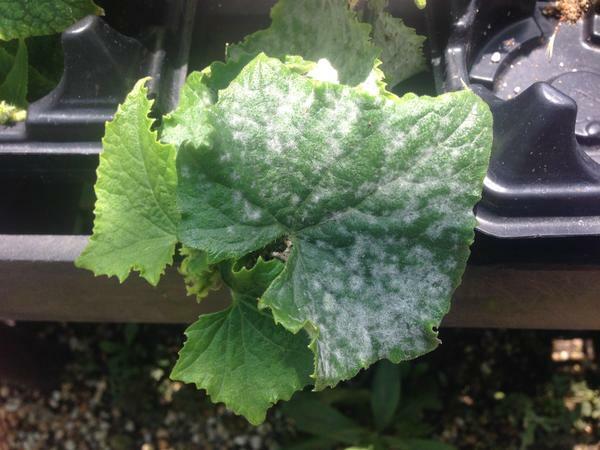 Cucurbit powdery mildew causes white, powdery fungal growth on leaves (Figure 1, Figure 2), stems, and petioles. Infection usually begins on older or shaded leaves of cucurbits. As the pathogen continues to colonize the plant, the leaves senesce early and fruit yield and quality can be affected. Speckling can be observed in the fruit of some cucurbits due to plant stress caused by powdery mildew infections. Figure 1. Cucumber leaf infected with powdery mildew. Figure 2. Squash leaf infected with powdery mildew. The disease prefers moderate temperatures of 68-80°F, medium to high humidity (50-90%), dense foliage, and low light. Infections can occur under dry conditions of relative humidity as low as 50%. The pathogen survives via conidia carried by wind over long distances. 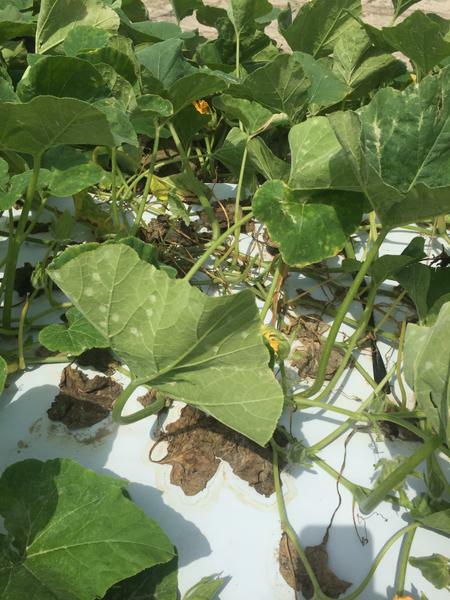 Fungicides may be required for control of cucurbit powdery mildew. Before disease appears, apply fungicides on a 7 to 10-day interval. Alternate products with different modes of action or fungicide group to avoid generating fungicide-resistant strains. For the latest fungicide recommendations for cucurbit downy mildew see the Southeastern US Vegetable Crop Handbook. Fungicide labels are legal documents, always read and follow fungicide labels. L Labeled on melons only, do not use Quintec on summer squash or cucumber. Organic growers have less chemical options that are effective; the only OMRI labeled active ingredients that have some efficacy against cucurbit powdery mildew are fixed copper formulations. Products containing the active ingredients copper or chlorothalonil (the trade name of one product with chlorothalonil is known as ‘Daconil’) are the best and only effective products available to home gardeners. In addition, home gardeners should grow varieties with tolerance. This factsheet was prepared by the NCSU Vegetable Pathology Lab in 2015.